We have pins! Glorious, shiny, rose gold pins! Like the cool kids. 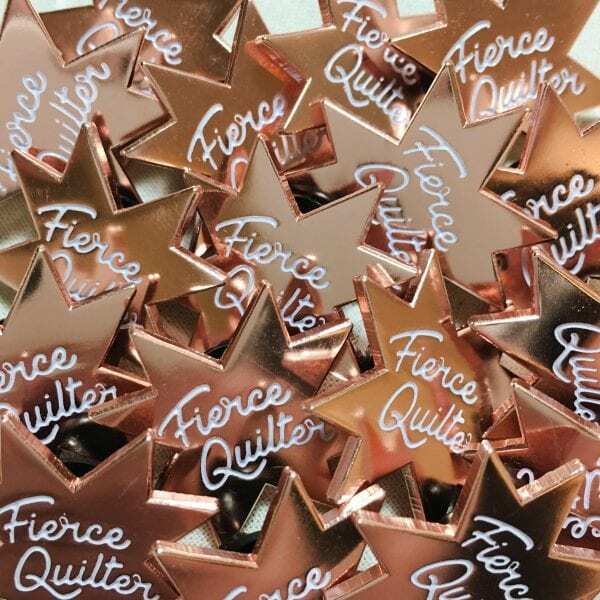 Now you can proclaim to the world your status as the Fierce Quilter we know you are. This adventure started, like so many other things, with me wanting to be a cool kid. The 90s are back in style, and though I’ll forego the brown lipstick, I am all for getting a jean jacket and loading it up with all the shiny flair I can. I’ve also seen them on purses, knitted shawls, hats, anything goes. There are so many cute pins out there but I have to say that fun quilt pins are severely underrepresented. So this is my first step to fixing it. I have tons of ideas for more, possibly even a quilt pin club, but let’s start here. The pins are listed here in our Etsy shop for a special 20% off price through the end of May. Be a cool kid, wear pins. And be a super cool kid and wear quilt pins.